Publication Information: Scribner. 218. 288 pages. Book Source: I received this book through NetGalley free of cost in exchange for an honest review. Opening Sentence: "When I first saw the advertisement in the newspaper I though I might actually burst." Favorite Quote: "Replying to readers was a careful business, and not just because I was worried about getting caught. 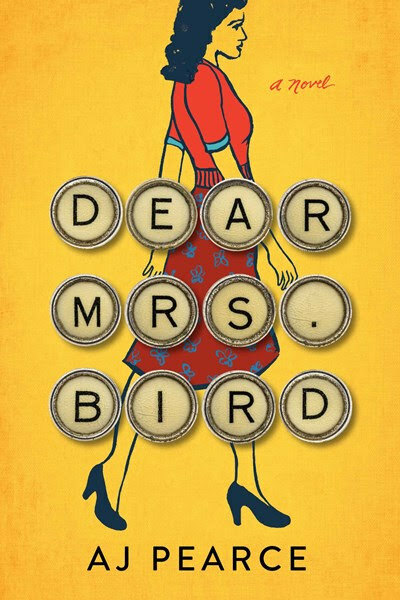 Worse even that this would be giving duff advice that made things sorrier for a reader..."
Dear Mrs. Bird manages a careful balance of the adventures and misadventures of a young woman and a story set in wartime London. Emmeline Lake is a young woman living through the nightly air raids in World War II London. In her personal life, Emmeline shares a London flat with her best friend Bunty. They both contribute to the war effort as volunteers who answer phones for the fire services. The war and the Blitz mean that the calls for fires come suddenly and often. Their close friend and Bunty's fiance is a volunteer fireman. Through this perspective, the book grounds itself in what life was like in World War II London. Professionally, Emmeline's dream is to be a journalist - a Lady War Correspondent as she puts it. She find what she thinks is the perfect job advertisement. She responds and is hired. Unfortunately, the job is not quite what she envisioned. She is hired by a journalistic enterprise, but her actual job is not as a war correspondent or really any kind of correspondent. The job is as a typist for the woman who answers letters in an advice column. Henrietta Bird has very strict rules about "pleasant" and "unpleasant." Translate that to read "proper" and "improper" as determined by Mrs. Bird. She, of course, only answers reader letters that contain no unpleasantness. Even in those cases, the responses are curt and following a very strict code of conduct. Emmeline disagrees. She sees the letters - even those or maybe especially those with "unpleasantness" - as voices asking for help. She cannot resist the call and decides to surreptitiously go further. In this context is Emmeline's real story. On the one hand, it is a light-hearted story of friendship, social outings, conversations about bosses, and family. On the other hand, it is a serious and often heartbreaking story of war and the death and destruction it brings. The two worlds almost seem separate, until they catastrophically collide. Interestingly, the book manages to maintain a tone in which both the joy of a young, independent woman and the sorrow of war manage to coexist and not clash. The joy does not undermine the seriousness of the tragedy of war; it rather reinforces the strength of people who manage to find joy no matter what the circumstances. In other words, I manage to laugh and cry in this book. Ultimately, Dear Mrs. Bird is a story of friendship and the ability of a true friendship to survive whatever life throws at it. Emmeline is young and at times innocent and naive. At the same time, her heart is in the right place, and she genuinely cares and tries to help. The book reminds you time and again that the war touched all lives. The resiliency of the characters is a testament to the Londoners who lived through the Blitz. It seems odd to characterize a book set in the middle of wartime London as sweet, but that is the note this book strikes.